The Weedy Sea Dragon (Phyllopterix taeniolatus) is a delicate specimen. Relatives of pipefish and seahorses, these creatures possess ornate appendages that jut out from their bodies, resembling the leaf-like shapes of the algae and seaweed that sway with the tide. The sea dragons themselves sway in time with the gentle surges of the ocean, adding to the illusion that hides these beautiful creatures from sight, away from the dangerous eyes of potential predators as they blend into their surroundings. They swim using small, thin fins that allow for precision movement, giving them control of their body to navigate through small gaps and holes within the encompassing weed and kelp. This morphology is common in species that inhabit areas offering plenty of hidey-holes and caves, with many fish living on coral reefs also possessing these fins. They are endemic to southern and eastern Australia, presenting an opportunity for divers and snorkelers to view a unique and mysterious animal without having to expend endless amounts of time and energy searching for an encounter. The leaf-like appendages and thin dorsal fin of the Weedy Sea Dragon provide camouflage, yet allow for precision movement amongst the seaweed and hidey-holes of their underwater habitat. This species can grow up to 35 cm in length and are carnivorous, feeding on tiny crustaceans such as sea lice. As is the case of the seahorse, males carry the eggs on the underside of their body on a sticky brood patch. Unlike seahorses, however, this is not an enclosed pouch, so the bright pink eggs are exposed to the ocean immediately. These striking marine animals can be found in many easily accessible locations within Port Phillip Bay, as well as the surrounding bays and inlets scattered across the Victorian coastline. One particular spot where they’re easily found is the Flinders Pier. 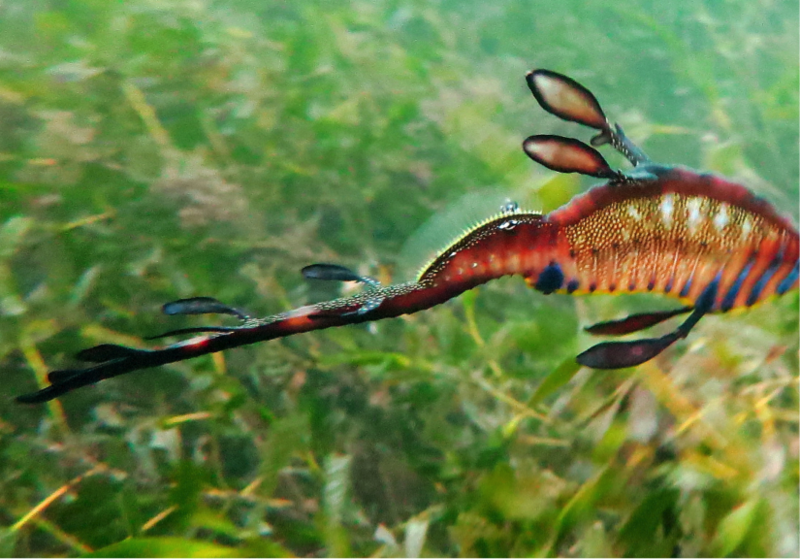 As long as you take the time to train your eyes and slow your movement to the pace at which the dragons live, the Weedy Sea Dragon is possible to locate in this popular area of the Mornington Peninsula.